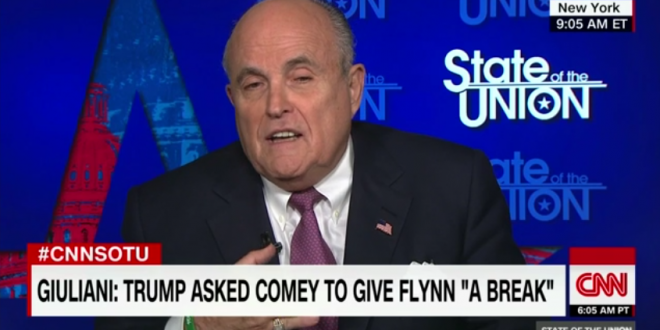 Giuliani: Obstruction Requires An Extreme Action Such As Trump Putting A Gun To Someone's Head [VIDEO] - Joe.My.God. President Donald Trump’s lawyer Rudy Giuliani said Sunday that if the President sits down for questioning by special counsel Robert Mueller, Trump will say he never discussed easing up on a probe of former White House national security adviser Michael Flynn with former FBI Director James Comey. “There was no conversation about Michael Flynn. The President didn’t find out that Comey believed there was until about, I think, it was February when it supposedly took place. Memo came out in May. And in between, Comey testified under oath, in no way had he been obstructed at any time,” Giuliani told CNN’s “State of the Union” anchor Jake Tapper. Giuliani said it would take some sort of extreme action for Trump to obstruct justice such as, if “say the president put a gun to a person’s head” in an investigation. “I think now our argument is that when he exercises his power as president … then it becomes really really questionable if it becomes obstruction of justice,” Giuliani said.